English Anatomical shape Well ventilated, High density PU foam skin matching colour. Preventive care for minor neck injuries like sprains and automobile whiplash. Cervical Spondylitis, Cervical Disc Disease, Cervical Neuralgia, Torticollis, Neck Sprain/stiff Neck, Early Rheumatoid Disease, Prevention And Treatment Of Whip Lash Injuries, Ortho/neuro Ortho/neuro conditions where Support Or Cervical Region Is Required. 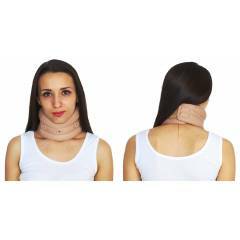 KS Care Beige Cervical Soft Collar Neck Support, KS-2012-M, Size: Medium is a premium quality Neck Supports from KS Care. Moglix is a well-known ecommerce platform for qualitative range of Neck Supports. All KS Care Beige Cervical Soft Collar Neck Support, KS-2012-M, Size: Medium are manufactured by using quality assured material and advanced techniques, which make them up to the standard in this highly challenging field. The materials utilized to manufacture KS Care Beige Cervical Soft Collar Neck Support, KS-2012-M, Size: Medium, are sourced from the most reliable and official Neck Supports vendors, chosen after performing detailed market surveys. Thus, KS Care products are widely acknowledged in the market for their high quality. We are dedicatedly involved in providing an excellent quality array of KS Care Neck Supports.